I discovered the works of J.R.R. Tolkien because of Peter Jackson’s film adaptation of The Lord of the Rings. For a little more than a decade, The Lord of the Rings and The Hobbit were all needed from Tolkien. I knew there were other works floating around, some related to the books I’d already read and some other mostly unrelated works. In the last couple of years I’ve gathered some of those other books. The first I read was The Children of Húrin which I thought was excellent. That was some time ago but I’ve finally finished reading another book by Tolkien: Letters From Father Christmas. The book collects a familial tradition that Tolkien began in 1920 when his eldest child, John, was but three years old. Every year the children of Papa Tolkien would receive one letter (sometimes more) from Father Christmas. They came in envelopes which were covered with little flourishes and unusual postage stamps that looked like something you could only get in the North Pole. Inside each envelope was a letter written is shaky handwriting that also had plenty of flourishes. They were handwritten by Father Christmas himself! He also drew pictures for the children on occasion and as the years went by his letter would be accompanied by additional notes from the North Polar Bear scribbled in the margins and later still, Ilbereth the Elf would write on behalf of Father Christmas when he got particularly busy. The letters vary a little in content based on the time of year they were written. If in November, for example, Father Christmas mentions how busy they’re getting up in the North Pole preparing for Christmas and he’ll often conclude by asking the children to tell him what they’d like as gifts. Otherwise, the letters tell of some of the activities going on in the North Pole since the last letter that was written. This often deals with some of the shenanigans the North Polar Bear has gotten into it (he’s well-meaning but very clumsy), a quick mention of what Father Christmas and his friends have done in the summer and how they’re preparing for Christmas day. A few letters focus on the thievery of the Goblins or their invasions of the store rooms. They’re fun and rather precious reads when you consider their real-world origins but ultimately reading them in quick succession you can’t help but be very aware of the formulaic nature of each letter. The content of many letters are so similar that it just feels repetitive. The Goblin invasion I mention above is the biggest exception to this formula. 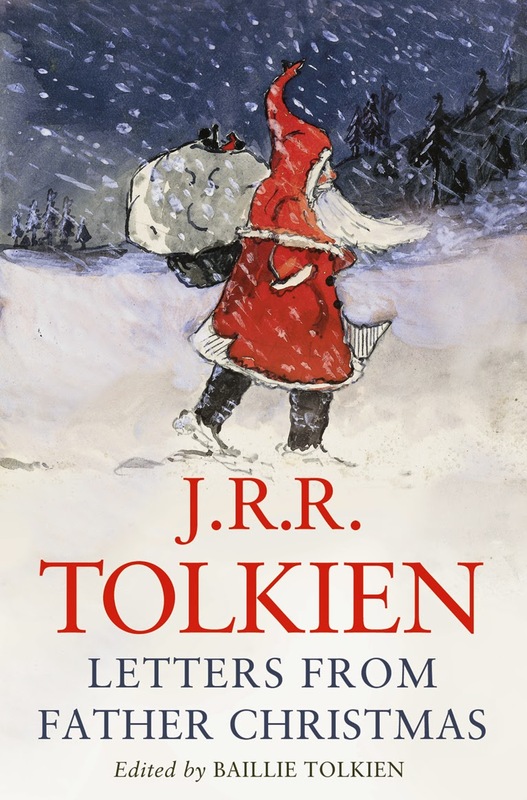 Despite the letters’ shortcomings as a serial narrative, Letters From Father Christmas is a wonderfully delightful book when you pull back from it and consider the tradition Tolkien (secretly) had with his children under the guise of writing letters from Father Christmas. That’s truly important because the letters are lovingly crafted. Seeing the amount of work Tolkien put into his letters is marvelous. His illustrations are colourful and fun but also quietly majestic at times. The envelopes are decorated and the scripting in the letters is stylized. 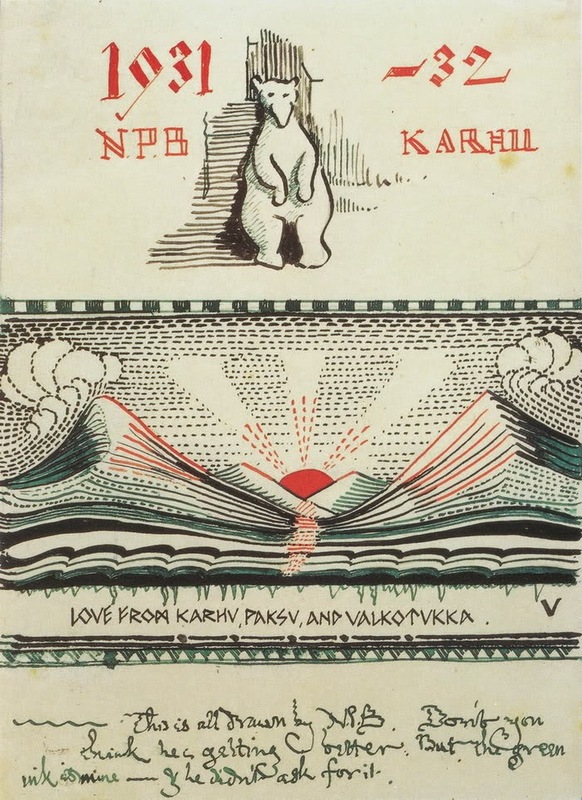 Each and every person who writes in the letters (Father Christmas, North Polar Bear and his cousins, and Ilbereth) all have their very own style of writing. Father Christmas’s writing is shaky because he’s old, North Polar Bear’s writing is very blocky and makes use of many straight lines since it’s difficult for him to write with his paws (indeed, he does better when using the pen with his mouth in later letters), and Ilbereth has a very spidery script which reminds me of Elvish writing from The Lord of the Rings. As if to strengthen that link Tolkien has Ilbereth write in Elvish in one of the last letters. What really makes Letters From Father Christmas a good read are the letters themselves and their presentation in the book. The production value of my edition is simply lovely. Thick, glossy paper which helps to bring the various illustrations and reproductions of the letters (and many of the envelopes those letter came in) to life. That’s very important considering the amount of craft put into the production of the letters, not just their content. It’s a hardcover volume which is important because this is the kind of book readers will likely flip through on a regular basis. Yet, it’s also a slim and rather compact hardcover, somewhere between the size of a mass market paperback and a the trade paperback (of not a novel, not of a comic book). It’s one of those rare book productions that manage to be both sturdy and handsome while also being compact and easily readable. When I pull back from the book itself and think of the idea of collection something very personal, something that used to only exist for one particular family, my enthusiasm wanes a little. These are inherently private letters, from a father to his children. You could probably discuss about Tolkien’s intention for hours (did he mean for the letters to ever be published?) but I think it’s a moot point considering the book was released by his estate. The more I think about this the more I think it doesn’t matter as much as I originally though. The letters existed for many years but their future was uncertain. By collection and publishing them the Tolkien Estate has ensured that a part of Tolkien will continue to exist in the eye of the publish for as long as it remains in print and a little while longer after that. 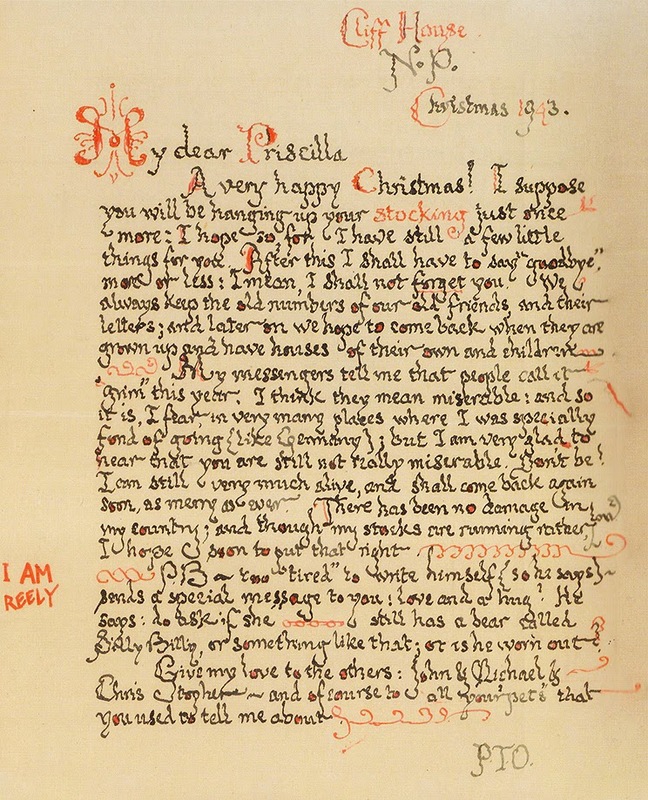 I think I would mind less about my intellectual heritage if it was published in such a nice way as Letters From Father Christmas. One of the nicest thing about this book is that it has a completely different appeal to me as a reader than the rest of Tolkien’s work I’ve had the pleasure of reading. I’m not a Tolkien scholar or even an exceptionally passionate admirer of his life and body of work. I rank him as one of the most gifted and serious fantasy writers of the 20th century but this is my first time reading a book by Tolkien the non-fantasy writer. Don’t tell me that because there are goblins, bits of magic and that Father Christmas is a potential pre-cursor for Gandalf that Letters From Father Christmas is and should continue to be considered a work of the fantasy genre. You’re missing the point. These letters weren’t written by Tolkien as a scholar or as a fantasy novelist, they’re written by Tolkien as a father. They’re imbued with so much love and joy that it’s impossible not to appreciate this book’s charm. 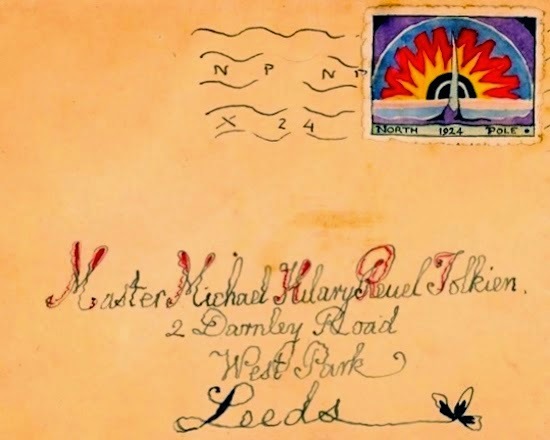 I’ve read letters and essays by Tolkien and they’ve often had a stuffy, overly-serious tone so to read his Father Christmas letters addressed to his children was a special treat because it added some much-needed lightness to the man and his legacy. I’m still a tiny bit bothered by the implications of publishing something so personal, especially posthumously, but this isn’t the first time a publication has been released after an author’s death and it likely won’t be the last. Yet, I’m starting to think that if the Tolkien Estate made the decision and his children were involved (they were, primarily Christopher Tolkien) then I really shouldn’t let myself be bothered by it and simply enjoy this wonderful gift from the life of J.R.R. Tolkien. Merry Christmas!